Children from the ages of 4-12 are welcome to join Michele in preparation for the mystical Halloween season. Participants will have lots of fun creating A3 photo frames to display all the spooky photos of family and friends in their scary costumes and because every good costume needs an imaginative mask to go with it, Michele will also assist the participants in creating their own unique mask accessories. The workshop costs €40 per child and runs from Tuesday, October 30 until Friday, November 2 from 10.30–11.30am for children aged 4-7 and from 11.45am-12.45pm for children aged 8-12. Pre-booking and pre-payment is required to secure a place for your child. 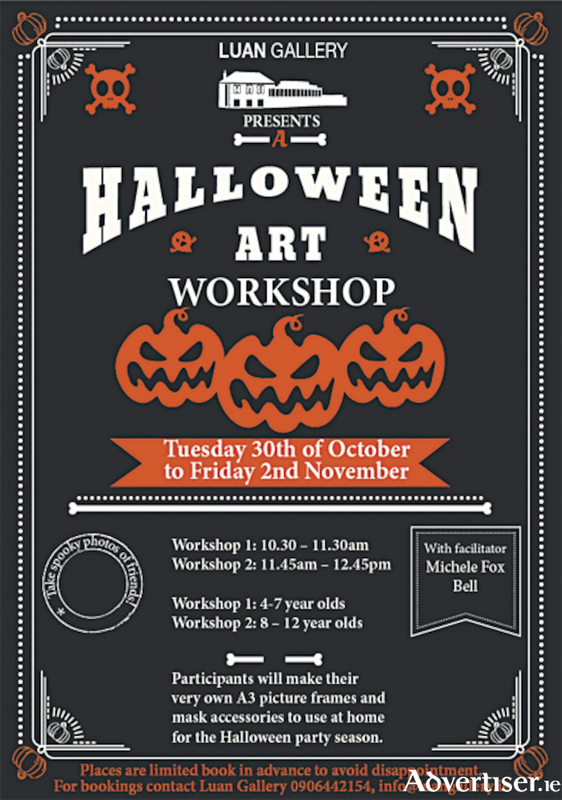 For further information on the children's Halloween arts and craft workshops in Luan Gallery or to book a spot for your child please contact us at [email protected] or call the venue on 09064 4215.